Kick off your long weekend with Nordstrom’s Clear the Rack sale, new tires from Discount Tire, some Anker car accessories, and more great deals. A bunch of Memorial Day sales are already live, and we’re collecting the best ones here. TCL’s P and C-series TVs are noteworthy for offering Dolby Vision HDR for a fraction of the price of most competitors, and you can get last year’s 55" C-series set for $500 right now, or $100 less than usual. The 65" is also $100 off its previous low price at $800, but it looks like it will sell out soon. These were technically TCL’s top of the line sets, but actually offered slightly worse contrast performance than the cheaper P-series, due to the lack of full-array direct backlighting. However, the trade-off is a slimmer, sleeker design, and you’ll still get a terrific picture and Dolby Vision. If size trumps features in your hierarchy of new TV needs, here are a couple of 75" sets that are surprisingly affordable for Memorial Day. This RCA is the barest of barebones sets. While it does have 4K support, it lacks HDR, and even built-in smart apps. But you can always plug in a 4K-compatible streaming dongle for the same effect, and at just $1,050 (including the mandatory $50 freight shipping charge), it’s one of the cheapest 75" sets we’ve ever seen. Or, for about $250 more, you can upgrade to a Vizio E-series with some HDR support (not Dolby Vision at this price, sorry) and built-in Chromecast. It’s still not going to give you the best picture quality on the market, but most higher-end 75" sets cost well upwards of $2,000, even during major sale events. If you already have a Philips Hue Hub (or an Echo Plus, which works as a Hue Hub), it’s time to stock up on bulbs. The full-color, 60W equivalents are down to $42 today, or about $8 less than usual. Hue works best when all of the bulbs in your home, or at least in a given room, are compatible, so buy a bunch! Don’t need colors? The tunable white models are also about $5 off. These can shift from warm white to daylight to any temperature of white in between, which is probably how most people use the full-color Hue bulbs 90% of the time anyway. Smart plugs are like a gateway drug into home automation, and TP-Link’s is down to $20 on Amazon right now, a match for the best price we’ve seen. This basically lets you control any device with an on/off switch from your phone, or even with your voice via an Echo device. 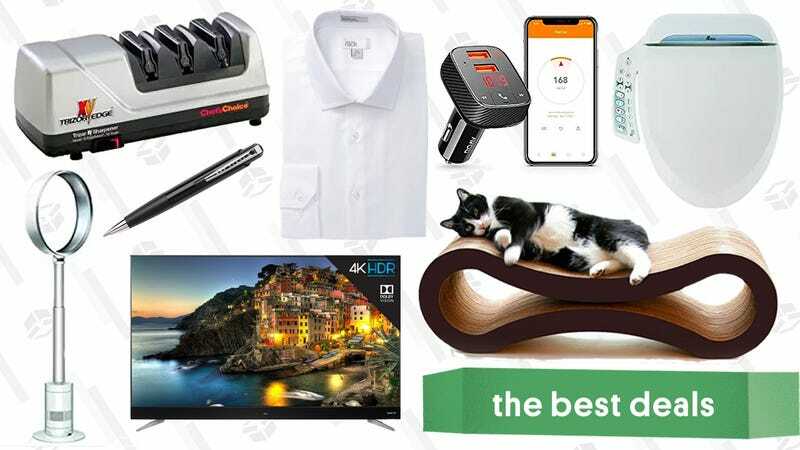 For one day only, Amazon’s Gold Box has a trio of Anker deals with prices that are even lower than we’d normally expect to see. The highlight of the sale is the SmartCharge F2 for $20. It’s a dual-port car charger, Bluetooth FM transmitter, and app-enabled car finder all rolled up into one. You only really need it if your car doesn’t have Bluetooth built in, but there’s nothing else quite like it. Just want the car charger part, without all the extra features? This one has two Quick Charge 3.0 ports for just $12. And for your desk, there’s also a five-port charging hub for $17. The Anker PowerPorts are our readers’ favorite charging hubs, and while this one isn’t one of the more advanced models with USB-C, it’ll still get the job done for things like phones, tablets, and Bluetooth headphones. Update: Also available at Walmart, if you want to pick it up in person today. Somewhat confusingly, the Series 1 is not quite the same as the original Apple Watch, as it has a second generation chip for faster performance. We don’t know how long this Jet deal will last, but I wouldn’t be surprised if it sold out soon. Best Buy just kicked off its Memorial Day sale event, with deals available on things you’d expect like MacBooks, 4K TVs, and Windows computers, plus some more interesting stuff like smart fridges and traditional appliances. The most interesting deals though are probably those involving Google Home. While the smart speakers themselves aren’t on sale, they do come bundled for free or at a steep discount when you buy certain other products. The release of Qi-compatible iPhones means that wireless charging pads are flying off the shelves, and you can score Anker’s 10W model for $5 off today with promo code ANKER253. Somewhat counterintuitively, dull kitchen knives are more dangerous than sharp ones, as they’re more likely to slip off the side of whatever you’re cutting, and go into your hand. Luckily, you don’t necessarily need to buy a new knife to get a sharp edge; this professional electric sharpener is down to its lowest price ever in today’s Gold Box. Boasting a fantastic 4.6 star review average from over 800 customers, the Chef’s Choice 15 XV can even convert standard 20 degree edges into even sharper 15 degree edges, meaning your knives could actually come out sharper than they were when you first bought them. Just remember that like all Gold Box deals, this $100 price is only available today, or until sold out. You don’t need a yard, or even any gardening skills to grow your own food at home; you just need one of these countertop gardens. These fully-integrated, soil-free indoor gardens can grow herbs, vegetables, salad greens, and flowers up to five times faster than regular soil, and this AeroGarden 7 is on sale today. You simply pop in the seed pods, pour in some water, occasionally add nutrients, and the machine does the rest. This one has accommodations for seven plants and includes enough seed pods to get you started. Although we’ve seen this particular garden get down to $90, today’s price at $100 is still a good discount from the usual $120. This multitalented Ninja coffee bar is listed at just $89 on Jet today. That’s a solid $35 cheaper than its Amazon price and the lowest we’ve ever seen. It can brew pretty much every coffee drink you can think of, including coffee designed to go over ice and speciality drinks like lattes and cappuccinos. Plus, you can brew whatever size you need, from a single cup to a whole 43 oz carafe (also included). If you’re in a need of a new coffee maker, this would be a great option or it would make a very nice gift. If you haven’t steam cleaned your carpet in awhile, get ready for a rude awakening; it’s going to be gross. This highly rated Hoover SteamVac includes a heated drying mode, and a handheld tool so you can use it on furniture and car upholstery as well. Get it for just $89 from Jet today, and thank us later. You’ve heard of Automatic’s smart driving assistant, but if $130 is too rich for your blood, this OBD2 dongle costs over 90% less (with code LMD5ITVY), connects to any iPhone or Android device over Wi-Fi, and can fulfill many of the same functions using various third party apps. If your tires are about due for a replacement, Discount Tire Direct is offering up to $100 in Visa gift card rebates (in addition to any manufacturer rebates) when you order four new tires as part of their President’s Day sale, plus an additional $100 if you order wheels as well, with extra gift cards available if you use or sign up for a Discount Tire credit card. Just enter your make and model, click the options to see tires on promotion, and you’ll see the rebate amount (either $25, $75, or $100) on the right hand side. Gift your cats the one toy they’ll actually use for $5 less today. This $45 PetFusion Cat Scratcher Lounge very rarely goes on sale, because with 6,000 reviews and an insane 4.8-star rating, it probably sells itself. It’s made of recycled cardboard and its curved design makes it easier for cats to scratch. These usually aren’t in stock for long, so I’d go ahead and pounce on this deal while you can. We’ve sold a lot of $20 mechanical bidets around these parts, so why pay over $200 for an electric model? It has a ton of extra features, obviously, but the one that really matters is a heated water reservoir (not to mention the heated seat). That means your tush has instant access to warm water, and you don’t even have to run a hose under your bathroom sink. $220 is the best price since early January, and within $20 of an all-time low. So the price hasn’t quite...bottomed out, but it frequently sells for over $300, so you can still feel over the moon for saving. There’s an old joke that NASA spent millions developing a pen that could write in space, and the Russians used a pencil. Whatever, it was totally worth it. Amazon’s selling the official Fisher space pen for just $11 right now, so you too can write in zero gravity, in sub-zero temperatures, or even under water. You don’t need to buy a new car to enjoy the life-changing benefits of a rear-view camera; you just need $64 and a few minutes to install one yourself (with promo code 9VN5VQBZ). This model doesn’t even require you to run a wire all the way to the front of your car; a wireless transmitter can just stay in your trunk and beam the picture to the included screen from up to 100M away. This 4.4 star-rated Gorilla Cart is built like a tank, and can hold 400 pounds worth of children, plants, boulders, or anything else that fits inside. And if it doesn’t fit, the walls are even removable, so you can haul larger loads. You might not have an immediate need for it, but $65 is the best price of the year, so this is a great chance to add it to your garage. LED bulbs last a lot longer than incandescents, and use less power, which means they pay for themselves while also saving you money every month. So if you still haven’t upgraded all the lights in your house, grab a half dozen of them from TaoTronics for $13 today with promo code KINJALB01. They aren’t dimmable, which isn’t surprising at this price, but I’m sure there are plenty of places where they’d still be useful. KitchenAid mixers are an essential part of every kitchen. If your kitchen is still lacking one, pick up this KitchenAid 4.5-quart Classic stand mixer for $189 today from Jet. That’s a match for Amazon’s current deal, but without the backorder, and available in both white and black. If your car seat or office chair doesn’t have enough lumbar support for your liking, this $15 memory foam cushion is easy to take with you anywhere, and will make you more comfortable while encouraging good posture. Just use promo code OA2MFDT2 to save at checkout. If you need to restock on dog or cat food, Jet is running a sale that should get your tail wagging. You can save 30% off brands like Blue Buffalo, Nutro, Fancy Feast, Greenies, and a whole lot more. So you can keep your furball and your wallet healthy and happy. Just be sure to enter promo code MAYDEALS at checkout. You will have to sign in to/create a Jet account to redeem the discount and shipping is free over $35. If you’re not already, now’s the time of year to really load up on sunscreen. Pretty cheap and not sticky, Neutrogena dry-touch is our readers’ favorite. This 2 pack of 45 SPF is $2 off today, bringing the price down to $12 when you Subscribe & Save. Just remember, you can cancel your subscription at any time after your first order ships. If you need anything for the outdoors, Backcountry has it on sale. There are a ton of sales going on (like up to 50% off items and 30% off one full-price Arc’teryx item as well) but their newest sale is an extra 20% off big brands like Marmot, The North Face, Mountain Hardwear, and more. Outerwear, layering pieces, bags, and more are discounted, so maybe it’s time to think about planning your next camping trip. There are a lot of deals to sort through, so if you have any suggestions, drop them in the comments! Once you go Yaak, you’ll never go back. Yaak’s M-series belts feature a magnetic clasp that’s so satisfying, you’ll wish every belt you owned had one. We’ve posted their old carbon fiber-buckled ABL belts before, and they’ve been a hit with our readers. Rather than using a series of inch-apart holes to find the right size, Yaak belts use a material that stretches up to 10%, so it’ll always fit correctly, even after you eat a big meal. Now through memorial day, grab one of the new magnetic models for $48 (down from $60) with promo code KINJADEAL. Levi’s is that All-American brand people love (and love to hate). You guys even voted them your favorite men’s jeans. Well, if you need some of those jeans, or a nice pair of shorts or a button down, Levi’s is taking 30% off sitewide with the code MAY30. That includes sale items as well, so it’s a great excuse to pick up new jeans. It’s officially spring: the sun is out, the plants are blooming, and your allergies make you constantly feel like you got hit by a truck. For a limited time though, you can save 15% on a bunch of allergy medicine from the likes of Zyrtec, Benadryl, Visine, and a lot more. Everything on this page is eligible, just be sure to use promo code 15ALLERGY at checkout. Need a relaxing way to fill the time this long weekend? Amazon’s got a whole bunch of digital movie rentals on sale for just $1 for Prime members, including classics like Ferris Bueller’s Day Off and recent hits like Rogue One. If you like XCOM, and you like Mario, the best thing you’ll buy today is Mario + Rabbids Kingdom Battle, which I’ve been playing pretty much nonstop for the last week. It’s just $30 at Walmart right now, so buy it today, and you’ll be ready for the Donkey Kong DLC whenever it’s released. The Nintendo Switch is better with friends, and you can add an extra player (or two, depending on the game) with a new set of Joy-Con. Both the gray and neon sets are on sale for $65 on Amazon today. That’s only about $4-$5 less than usual, but they don’t get cheaper than that very often. Overwatch got a game of the year release late last year, and you can grab a copy for an all-time low $20 on PS4 or Xbox One, if you somehow don’t already own the game. There’s not a whole lot to Double Ditto, but it’s $9 today (down from $20), and seems like a great game to play with the family over the long holiday weekend. Pick a card, read it out loud, and then quickly write down 2 answers you think other players will also write. Laugh or cry as you discover whether you were able to match any answers with other players. Find out whose mind is in sync with yours. It may not be who you expect! Be sure to enter promo code SUMFUN55 at checkout.